He is forever cursing the kids who climb on the rails and the evil archeologists who animate the exhibits. Cairne, Abomination in case of Aggro, Anubisath would be a pretty good pull...there are actually a fair few good deathrattles that still remain. Yes, some of the best are going away, but that doesn't mean this card will be completely useless. Even Chillmaw and harvest golem are not that bad. I think Priests got a greatly-needed buff in Arena with this new ability for them to draft Sneed's Old Shredder at common. Just a great all around card, owed to Versatility. Barring an opponent who is threatening lethal next turn (and in some cases, even then), there is literally no time where top decking this guy and playing him will leave you worse off than you were. He's great in the early game, a body down, and essentially a card drawn for later. He's great in the late game, a body down, and then you play the creature he discovers. Deathrattle creatures are amongst the most powerful creatures in the game, and just the fact that you, having seen what type of deck your opponent is playing, can choose between three options makes this card incredibly adaptive. I've even gotten a majordomo from this guy, reduced it's cost with Emperor, and styled on my opponent by bgh'ing it and finishing him with a hero power. Good things happen when you play this card. Aside from Reno Jackson, this guy might actually be my favorite card of the set. I put him in my Golden Monkey deck and he's been amazing. It's the perfect card to play turn 2 or coin turn one. The cards you pick from let you smooth out your curve for the next 2-3 turns, and you get the 1/2 body in the mean time. At the worst, this card lets you pull Dark Cultist a lot, which is always a plus, at it's best you get another Sylvanis, Shredder, even Piloted Sky Golem for free is nothing to snuff at. How will be this card without gvg and naxx cards? The right way to think about this card is a 2 mana tracking into someone else's death rattle deck without tapping your own deck, and the 1/2 body is just a bonus. Plus what better card to play into a freezing trap or with bran since all it's value is in it's battle cry. This card is insane and made me win so many games. It's very rare when you don't have a good choice to tech your deck according to the opponent. Discover is a tremendous mechanic. Applied to deathrattle minions, it's simply awesome. First reaction: hmm this doesn't look all that good. After a few seconds: omg a turn two play for priest omg omg omg. Exactly this. The stats really doesn't matter, althrough a 1/2 is for 8 of 9 classes bad, luckily priest ist none of the 8 classes. When you have Zombie Chow on the Field too, you nearly always have a Target for Velen's Chosen. Turns out it is preeeeeety good. This card is just insane, not a strong body for 2 mana but it helps control priest to curve better and be more proactive. Not to mention I heard you often get priest's themed card. But still I hate the fact that it has only 2 hp and even worse 1 attack. It's kind of hard to get a board presence with this card when you're playing a control priest. Granted we have velen's chosen, but sometimes you'd better use it for another minion instead. I'm still trying to figure out what's the best play from it. You're basically playing a novice engineer but with 2 hp and no card draw (discover =/= card draw) which could help against fatigue (helped me in 1 game out of like 30 so far). Priest themed card means for Museum Curator = Dark Cultist, because it's the only Deathrattle-Class-Card we have. And actually that's pretty good. Dark Cultist can be so insane, and having more than the 2 i already have in my deck won me is always good, even in lategame. With this you can actually play up to 4 cultists; might not be always viable, but still having a third one can save you really the day, especially when you don't have a good curve yet. 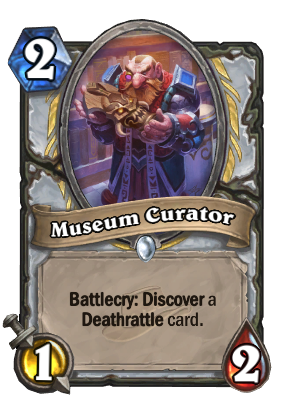 Conclusion: Meuseum curator should be though of as a 2 mana 1/2 + tracking into a deck of death rattle (both for the cost of 1 card). It's beauty lies in it's versatility. It's good from turn 2 to turn 10. IMO a must have in the new priest meta deck.